Kat Leonard asked us to join her in this 1000 word challenge. Although I gave myself a deadline for Sunday, I was able to finish this short story today. Also included in the challenge was Life With More Cowbell. I have posted both of their story links and the original challenge link at the bottom of my story. No se mueva. Mama estará de regreso en un minuto. Cicada’s were singing, their voices drifting high up into the mango trees. The fruit so ripe that the pungency of the pregnant yellow fruit, floated through the air like humming birds seeking out nectar. Beneath the largest of the trees was a rusting carousel, a retired antique from the 1950‘s. The tree branches low enough to the ground that customers entering the bodega would often pick them. Leaning against the carousel, a five year old Marlena fidgets with a nervous twitch that annoys her already agitated mother. “Do as you are told, I will only be a minute.” Marlena knew this was not so. Her mother was never just… a minute. Never even just an hour. Today she would be forever. Absent-minded, she brushes Marlena’s hair away from her face, fixing her pony-tail, kisses her on the forehead before walking toward the bus stop. Marlena silently watches, as her mother boards the bus. Even at 9 am, the heat was making vapour shadows on the pavement. Marlena had already drank half of her bottled water. A bottle her mother filled and froze each night, in hope that the melting ice would slow Marlena from drinking the water too quickly. The Cuban sun had other ideas, it’s scorching heat setting fire to the already humid air, the condensation evaporated from the one litre bottle, before the drops had run down the entire length of it. With each drink of water, the melting ice scraped against the inside of the plastic, a muted warning that she must save the water for the hottest parts of the day. Rita was only fifteen when she had Marlena. A child whose family came from generations of farmers, Rita refused to live the same life. Hands calloused, sore muscles and sun hardened skin was not the picture she painted for herself. She wasn’t going to spend a life looking at shanty walls, cooking for a labouring husband or wash stains from aged white shirts. 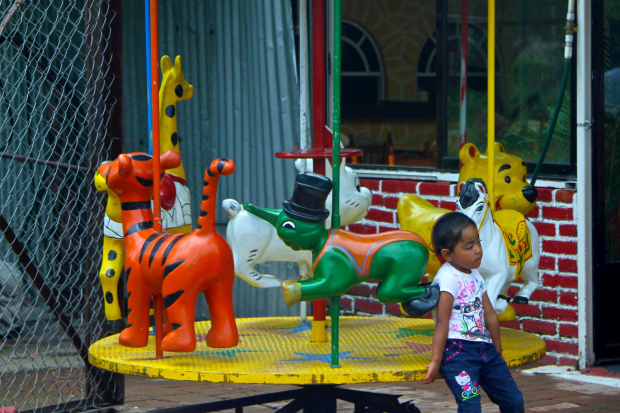 She saw her future as an entertainer in the resorts. Dreaming that one day, a rich tourist would sweep her away to America. Three days after her fifteenth birthday, she found herself getting off a bus, smiling as she welcomed herself to Havana. After several weeks in the city, her dreams weren’t panning out as she’d hoped. There were no rich tourists and after being kicked out of a rooming house, found herself hiding in the streets, moving from one rat infested hovel to the next. Her ‘rich tourist’ left her pregnant, stranded and scared. Her life now consisted of vomiting up morning sickness and stealing fruit from the orchards at night. Marlena’s father was a ‘tourist’, staying at one of the five star Playas. All inclusive Cervezas, slow dancing in a dirty dancehall and promises that only a fifteen year old dreamer would believe. He convinced her that in only ten short days he would whisk her away to the big city, as long as she kept him ‘company’ for his stay. Each morning before making their walk to the carousel, Rita would fill a knapsack with a one litre bottle of water, several mangos, rice cakes wrapped in banana leaves and four empanadas. Every day, instructions were repeated that the rice and one mango was for breakfast, one empanada and 2 mangos for lunch and the final two empanadas and any remaining mangos were her dinner. Marlena wasn’t allowed to speak to anyone other than the lady that ran the bodega and if she needed to nap was to crawl into the small space between the back of the tree and the store wall. Before they left the shanty, Rita pinned a note, written on paper with a rainbow on it, inside Marlena’s shirt. The old carousel was placed outside of the badego as a tourist attraction. It’s bright colours matching the shingled walls of the building surrounding it. The carousel never worked, most of it’s parts rusted and it’s mechanics seized. When it first arrived the neighbourhood children would try to make it work, but like the sword embedded in the rock that only King Arthur could release, it never budged. The only reward for trying being a tetanus shot, from the rust splinters that would end up in someones hand. The woman who ran the bodega would check on Marlena several times through out the day, often bringing her candy or homemade treats. As she was locking up for the day, she noticed a small shoe sticking out from behind the mango tree. A panic swept over her, Marlena shouldn’t still be there, it’s well past 8 pm and the night was wrapping itself around them. As she moved closer she could hear Marlena softly crying. After much coaxing Marlena finally emerged from behind the tree. Brushing the dirt from Marlena, she notices the safety pin sticking out from Marlena’s t-shirt. She unpined it and after gently unfolding it, stood up and read the note. If you are reading my note, I am on a boat to America. I have gone to find Marlena’s father and to start a better life for us. Please take care of her. She is a good daughter. When I have settled, I will send a letter to the lady in the bodega. Challenge posed by Kat. Challenge accepted! Shark Attack at Plasticine Poetry !!! Freely offering the audience manual sexual gratification Cathy Petch hosted another wild night at Plasticine Poetry. After a rapid-fire onslaught of open stagers (I got into that initial rush with my shark week piece) we were ready for the first feature. Another great review from Duncan! 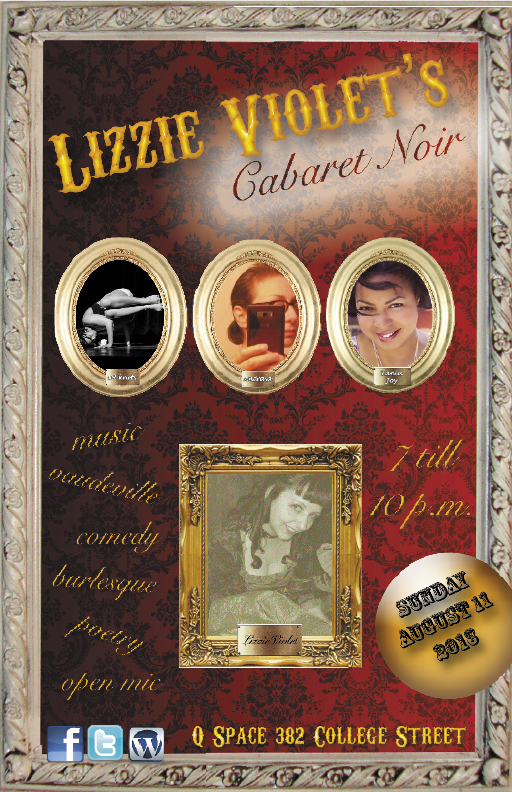 The August Noir hosted by Lizzie Violet, was her Cabaret’s farewell to Q Space, which is sadly closing at the end of the month. Noir is moving to The Central in September. After a round of open stagers (including myself), dancer Andraya hit the stage with the first of her three numbers. Her performances were scattered throughout the show. It was refreshing to watch dance that was from the body, dance didn’t feel compelled to tell a story (as seen on So You Think You Can Dance.) Andraya didn’t overwhelm with flashy physical prowess but invited us in with a vocabulary of small shoulder gestures, sharp arm movements and emotional longing. She went from stillness to fluidity with appealing intensity, leaving the stage in a flurry of glitter.